Walking through the Serpentine’s new exhibition, a retrospective of American artist John Currin, brings an immediate smile to my face. A smile at the intrinsic humour of many of the paintings, but also smiles of recognition as the influences from the history of art are gradually revealed. 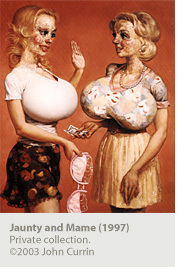 Critic David Cohen described Currin as a “disingenous and meretricious hack” in an article that claimed the artist’s audience was in fact, the “artworld insider” and contrasted his vulgarity with Norman Rockwell: “While Rockwell sought to console the million, Currin would probably be content to rake one in.” Strong stuff, but also more than a little unfair and misguided. 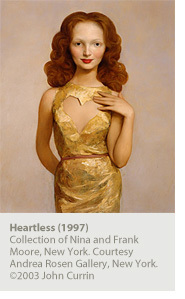 Men are seldom featured and when they are, they’re pushed out of the frame or cropped by the painting’s edge, such as Park City Grill (2000). The exception is a brief series of images dealing with homosexuality or featuring gay men. 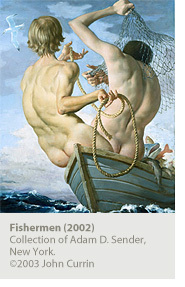 It would be accurate to suggest that Currin feels uncomfortable painting men: they lack the unforced sensuousness and variety of the women, but make a mildly diverting subgroup, a lukewarm and slightly unconvincing attempt by Currin to diversify. That’s not to say all his male renditions are failures, far from it, and some, such as Two Guys (2002) radiate genuine warmth and an affection for his subject. The exhibition begins chronologically with his paintings from the late eighties and early nineties featuring strangely blank-faced women, often looking off-frame, with dark, expressionless eyes, devoid of any highlight. It’s as if their eyes are black holes sucking inwards any light that they would normally reflect. This is followed by paintings of from 1993, where Currin’s technique begins to nod towards the Expressionist techniques of Max Beckmann with thicker, more obvious brushstrokes and exaggerated features. He also began his series of girls lying stationary in bed as if too ill to move or communicate, blankets pulled up to their chins. Currin describes them as “completely passive” a reaction against the earlier paintings where he felt that the harsh, minimalist backgrounds were like acts of violence. Perhaps more disturbing than the large breasts is the treatment of the faces. While the bodies are lovingly painted with gentle curves, the cartoonish faces are rendered with violent impastos of thickly applied paint. The contrast in the approaches to the face and body is the reverse of the later Buffet (1999), where it’s the face that is carefully painted and the background and body quickly dashed off with vigourous brushstrokes. This sea-change in stye and approach to women could perhaps be explained by his marriage to sculptor Rachel Feinstein, whom he began to use as inspiration for many of his subsequent paintings. Although the women in his later works are not precise recreations of his wife, it’s clear from his first actual portrait of her, Rachel in Fur (2002), that he has been drawing on the proportions of her face. Whether or not you enjoy the exhibition really hinges on what stance you adopt on his attitude to his subjects. Personally I find the off-kilter humour, laced with a kind of unsettling melancholy, gives the work a depth that makes the images stick in the mind. It’s clear that Currin loves the female form and intrigued by the feminine mind, and when combined with influences that range from Italian artists of the fifteenth and sixteenth centuries to cheesy girlie magazines the results are unexpectedly beautiful and arresting.